02.12.2013 - PICTURE STORY: 16 teams successfully entered the gates of the EHF Cup Group Phase over the last weekend. Check their action and emotion on the courts in the gallery created from the pictures of local photographers. 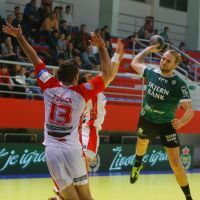 01.12.2013 - ROUND REVIEW: The qualification for the top 16 of the competition is over as also the 2003 EHF Champions League winners Montpellier Agglomeration HB. 30.11.2013 - ROUND REVIEW: Ten teams qualified for the EHF Cup Group Phase on Saturday as only German and Swedish handball have a double representation so far thanks to Füchse Berlin and TSV Hannover-Burgdorf, respectively IFK Kristianstad and Lugi HF. 29.11.2013 - ROUND PREVIEW: EHF Cup Finals bidders Füchse Berlin are heading to Belarus to defend their tiny two-goal lead, while Chambery take only one-goal cushion to Hard in the second leg of the last qualification round before group phase.